← How to change PDF document with different page size? Answer: According to your needs, you need to print PDF file in HTML website without downloading PDF file. Meanwhile the online PDF file within PDF could be opened at any kind of browsers including IE. According to your needs, maybe you can have a free trial of VeryPDF cloud based application named Free Online Document Viewer, which can help you print PDF from HTML website. This application can work under any kind of platforms and browsers, so you do not need to worry platform problem. Meanwhile, this is cloud based application, if you just need to pint PDF from website directly, this software is totally free for you. Please check more information of this software on homepage, in the following part, I will show you how to use this software. The following snapshot is from the website of Free Online Document Viewer, please have a check. It is quite easy to use. Simply click button Browse to add PDF file to website and then input API code if you have. Choose output format, Flash paper viewer or HTML 5 paper viewer. When you need to use this application on Android system, please choose HTML 5 base code. For your situation, if you just need to print PDF from HTML website, both of them are OK for you. In this article, I will take Flash Paper Viewer for example. After setting, please click button View Online to check online files. Step 2. Print PDF on website by clicking print button. When you choose Flash Paper Viewer and click button View Online then you will see the following snapshot. You can use it as PDF online viewer as it allows you to change local PDF to online PDF for sharing information with your clients, customers or others. 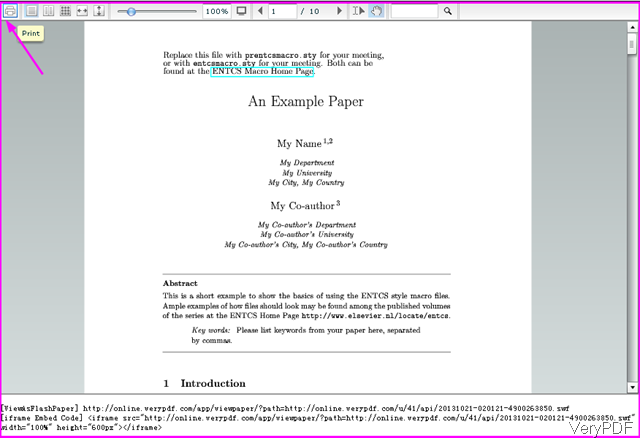 If you need to embed PDF to website, this software also can help you make it. On the top of the menu bar from the left beginning,you can find the button icon of Print. Simply click it then you will print this PDF file to printer. By this free online cloud based application, we can print PDF in website. During the using, if you have any question, please contact us as soon as possible. This entry was posted in VeryPDF Cloud API and tagged print PDF. Bookmark the permalink.